WASHINGTON — The Redskins head to training camp this week without any drama whatsoever. When was the last time you heard that? 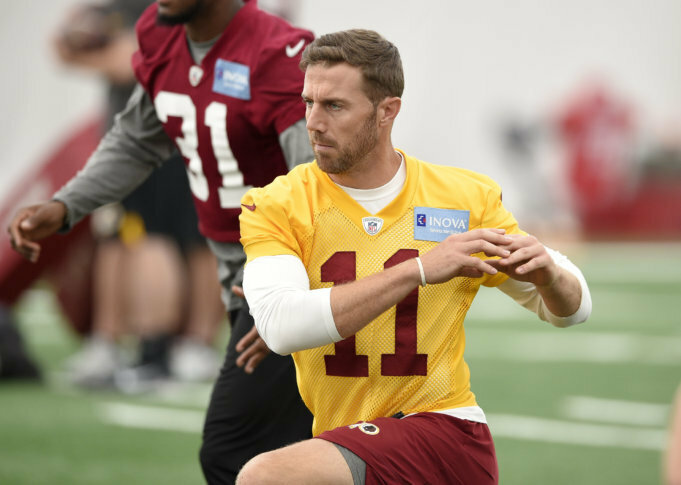 Will Alex Smith be able to take the Redskins to the next level? Kirk Cousins is gone. There are no more questions about Cousins’ contract situation or about his commitment to the Redskins. It’s time to move on for both parties. The Redskins gave up Kendall Fuller and committed $71 million to their new quarterback to win now. Gruden knows that there is no time for a learning curve and that his team needs to get back to the postseason. Smith has established himself as a leader already this offseason and Jay Gruden has called him one of the smartest players he’s ever been around. Smith has some new weapons to work with, including wide receiver Paul Richardson and Josh Doctson along with a healthy Jordan Reed. He also has to hope his offensive line can hold up and give him time to work (Washington allowed 41 sacks and 98 QB hits last year to Kansas City’s 37/83). The emergence of a running game will be a big factor as well. The Redskins have some depth on the offensive side of the ball this year, and if everyone can get on the same page with Smith, then the offense has potential to do some good things this year. Will the running game improve? It’s no secret that the Redskins running game needs to contribute more after a 2017 season in which it ranked 28th in the league with under 100 rushing yards per game. The team got perhaps the steal of the draft, taking LSU running back Derrius Guice with the 59th overall pick. He has endeared himself to the Redskins and the community since being drafted and will be fighting for the starting spot. The expectations are high for Guice. Chris Thompson heads to camp fully recovered from his fractured fibula last season. His role is set in Jay Gruden’s offense, and he was arguably the offensive MVP last year — averaging 4.6 yards per carry on 64 attempts and catching 39 passes, four for touchdowns — before he got hurt. Thompson is a big weapon at Alex Smith’s disposal. Along with that, the offensive line needs to be better and healthy. Despite being one of the most injured position groups in the league last year, the Redskins did not upgrade the depth along the line. The left guard position will be a big question mark all of camp. How will the defensive additions fit in? The Redskins have had some movement on the defensive side of the ball and it started with drafting defensive tackle Da’Ron Payne out of Alabama. He will start from day one along side former Alabama teammate Jonathan Allen. Allen returns after playing in only five games before suffering a season ending Lisfranc injury. Along with Payne and Allen, the Redskins are hoping Matt Ioannidis, Stacy McGee, Anthony Lanier and Ziggy Hood combine to solidify a run defense that ranked last (32nd) in the league last year, allowing over 134 yards per game. That’s a stat that should improve with a healthy Allen and Payne. The Redskins re-signed Zach Brown this offseason and are solid at linebacker along with Ryan Kerrigan, Preston Smith and second-year player Ryan Anderson. The team will need to replace two starting cornerbacks alongside Josh Norman, as Bashaud Breeland left via free agency and the nickleback Fuller was traded to Kansas City in the deal for Smith. The pass defense was ranked ninth a year ago and has added veteran Orlando Scandrick and six other draft picks. The team locked up cornerback Quinton Dunbar this offseason and he, along with Fabian Moreau, is expected to have a breakout year and play a major role. D.J. Swearinger returns as starting safety, and you can expect to see a lot of Montae Nicholson. Gruden is very high on the second-year player. These are just the few of the questions that need to be answered before the season opener in Arizona on September 9 in Arizona. Check back all throughout camp for our daily live blog from Richmond.